The solarium has also proven to be a useful appliance in the daily care of the horses, and is primarily used after they have finished their exercise in the equine pool. Immediately after swimming the horses are led into the solarium where they are washed off and the chlorine is rinsed from their coats - the heat lamps stopping them from getting cold. 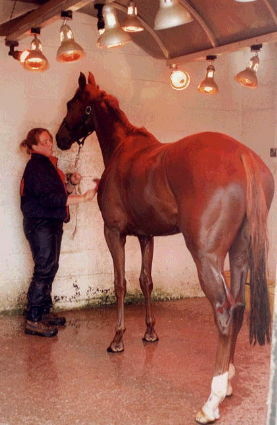 The heat from the solarium keeps the muscles warm and supple, and again is particularly useful for horses with injuries. For example, a horse that may have fallen at the races can become quite stiff - the solarium eases the muscles and prevents the horse from stiffening up too dramatically.